As a pediatric physical therapist I am constantly asked what footwear I recommend for the summertime. There is a plethora of shoes to choose from for your little ones and with such variety, it can be easy to get confused. Happy footwear leads to happy feet. It is important to let your baby’s feet develop naturally to ensure that he develops a proper arch. In an ideal world, barefoot is best. 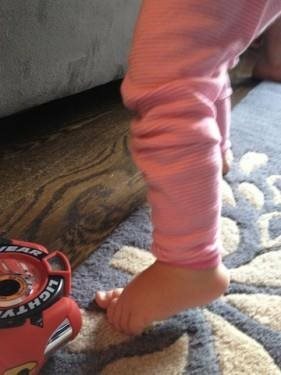 In reality, we are barefoot through the first year of life, and early walking shoes provide little support in order to allow for natural development. A shoeless world is not realistic because we have to protect our feet from the environment. A great many of our children have low muscle tone and loose ligaments in their feet; this manifests as a lack of arch development and therefore a lack of stability up through the leg. If you want to build a strong house, you need a strong foundation, which is essentially what our foot arch does for our entire leg and body. It is essential that our children have shoes that allow for natural development. Shoes with built up arches typically include sneakers and a VERY small selection of summer sandals. These shoes are essential for our children with low muscle tone and/or loose ligaments. Floppy or “mushy” muscle tone can mean weaker muscles; although, not all of the time. If there is a weakness in the foot, then external support is critical to ensure a strong and stable base for your child. For example, flip flops do not provide adequate support for your children. Yes they are comfy. Yes they are fashionable, but most of them do not have arch support or even allow for a proper walking style. As a parent, you may not know if your child has low muscle tone, lacks an arch, or has loose ligaments. So start with your pediatrician. During your child’s next physical exam, ask the doctor about footwear or, for another opinion, go visit a physical therapist or an orthopedist. Proper shoes ensure less fatigue for your little one and less complaints of discomfort. 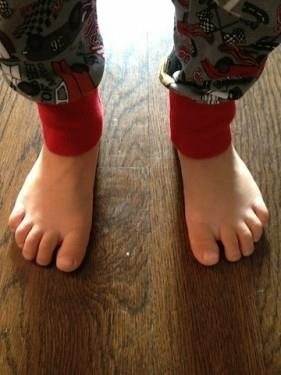 Some fun ways to strengthen your child’s feet and arches are walking and running on varied surfaces. For example, sand at the beach is ideal; feet and calves get a massive work-out, and the sand also provides a wonderful sensory opportunity for your child’s feet. It’s always great to expose your child’s skin to different textures. Amanda Math MPT, received her Masters Degree in Physical Therapy from Rutgers/UMDNJ in 2001. She is the principal Physical Therapist at Jumping Jax. Amanda has extensive experience working with children of all ages. She has been evaluating and treating infants, toddlers and children with a wide variety of developmental, neurological, musculoskeletal, and congenital impairments. She incorporates her passion for physical therapy with her love of athletics and has completed extensive course work. Amanda has presented multiple workshops for Special Education Preschools and Elementary Schools throughout her career on a variety of developmental, neurological and musculoskeletal topics. The Easel: How to promote hand development and strength! Check out these preschool apps that are great learning tools for ages 2-5 years old. Enjoy! As a mother of two lovely children (ages 1 and 4), I find myself multi-tasking more than I have ever done in my life. From the moment I wake up in the morning until I go to sleep late at night, I am organizing the tasks in my head. I plan, plan, plan….that is how I survive working full time and being a mom. I have always been good at planning and have always been able to manage many things at one time both physically (carrying groceries, pushing a stroller, holding my coffee, and feeding a snack to my child) and mentally (thinking of the sequence of steps). My husband… not so much. While I think he is an amazing father, he CANNOT multi task. As an Occupational Therapist, one of the areas that I work on the most in my work with children is something called motor planning. In very simple terms, motor planning is broken down into two steps: first, being able to generate an idea or a “plan” when confronted with a new task. The second step is putting that plan into action. It is in essence, your ability to problem solve. If you fail the first time, it is the ability to plan something different based on the feedback you get from the first attempt. Some children get stuck in this planning phase where they either avoid the task all together because it seems to difficult or overwhelming (why even try when you are convinced that you are going to fail?) or will try it one time, become frustrated, and ultimately give up. Other children can come up with a plan but cannot physically get their body to do what they want to do (either by lack of strength, coordination, balance, or sensory processing to name a few). The children I see with these difficulties have an eerie similarity to my husband’s inability to multitask at home when confronted with something new and scary (like bathing two children at the same time in the bathtub). He freezes, is completely disorganized in his plan, and his execution can be unsuccessful. Now some would say that he is doing this intentionally; but I have analyzed this and I realized that he has difficulties motor planning and probably always has. I asked him the other day, how he can possible multitask at work (given that he is very successful) and he stated “it is hard for me but I do it”. 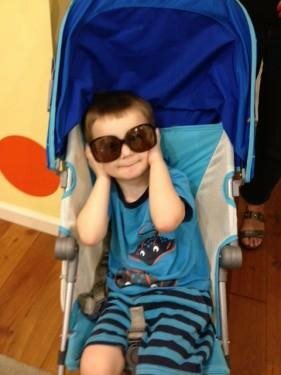 I started thinking about all those children with motor planning difficulties who see something fun, like climbing a jungle gym at the playground or learning how to write letters for the first time, as so overwhelming that they won’t even try it. As a mother and therapist, I strive to break down new tasks to my children. If your child is having a hard time figuring out for example, how to climb the jungle gym to get to the top of the slide, show him, step by step, where to place his feet, where to place his hands, and how to pace himself while doing it. If he fails or gets scared, praise his attempt and let him come back to it when he is ready. Go back to it often and try it each time, using the same strategy. Going back to my husband, I sometimes need to break down each task into clear steps, so that the next time he is on “daddy duty”, he is more confident that he can do the task and this mommy can take a much needed rest break. Karinna Dancourt MS OTR/L received her Masters Degree in Occupational Therapy from Tufts University in Boston, Ma in 2001. 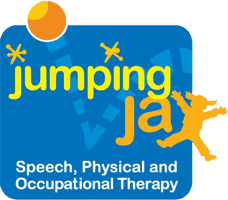 She is the principal Occupational Therapist at Jumping Jax located in Manhattan on the UWS. Karinna has worked in a variety of settings including hospital based, school-based and Sensory Integration clinics performing evaluations, direct treatments, consultations, and school observations. She has extensive training in Sensory Integration, Handwriting Without Tears/handwriting interventions, and neurodevelopment treatment for children ages 3-18 years old. Karinna is bilingual in Spanish and English and is a proud mother a four and one year old. 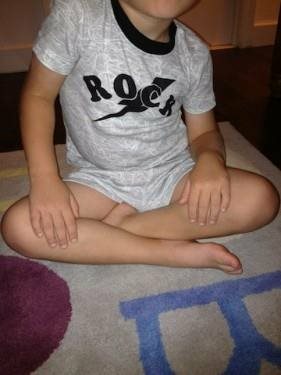 “W” sitting is a terrible position for your toddler and even extends through adolescence. This position is when he sits on the floor on his bottom with his legs out to the sides in the letter “W”. This position places undue stress on not only his leg muscles but also excessive stress on hips and knees in internal/medial rotation. This sustained position can cause shortening of leg muscles and loosening of joints. It can lead to abnormalities in bony alignment and gait. Significant issues can arise in balance, coordination, strength, and big gross motor skills. These are skills that require use of our big muscles. 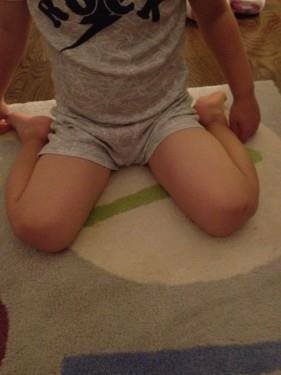 “W” sitting is a preferred position for your toddler because his hips and knees both allow for this increased joint movement and it is an extremely comfortable position. The key reason why he enjoys this position is because it provides a wide base of support; therefore, he does not have to use his trunk muscles that much to maintain stability in an upright position. Not only does this position not allow for him to strengthen his trunk and posture muscles, but this lack of strength will also lead to a variety of limitations in balance, coordination, gait, motor planning, and even difficulty with attention skills when trying to sit upright in a classroom chair. Every time developmental opportunities are maximized, such as working on trunk strength in good positions, there is always great impact on academics down the road. 1) Tailor sit “criss cross apple sauce” or my favorite name “Pretzel” –this position is truly the opposite of “W” sit. Pretzel allows for external/lateral rotation of hips and knees, which places these joints in better positioning for typical alignment and development. Tailor sit allows for a great deal of trunk and posture strengthening, due to increased trunk rotation and the ability to cross the centerline or “midline” of his body –imagine a line straight down from your nose to the space in between your feet. Many of our children today have great difficulty crossing this midline When he crosses midline, he is encouraging the development of bilateral coordination. This is a crucial skill that allows for the two sides of the body to work together. Bilateral coordination is not only important for coordination and motor planning, but also for the development of most academic, perceptual, and handwriting skills down the road. 2) Long sit – this position is when he sits on his bottom, with his legs straight out in front of him. This is a wonderful position because it is a great challenge for trunk and posture strengthening. It also allows for increased trunk rotation which will target the oblique abdominal muscles. 3) Tall Kneel – this position is when he has his knees on the ground with extended hips and trunk, maintaining an erect upper body. This position maximizes strengthening of the trunk against gravity, with also helps to maximize strengthening at the pelvis and hips joints. This is an ideal position when playing at the coffee table, practicing crossing midline by placing puzzle pieces all around him on the coffee table. If you want to add an additional challenge, place the puzzle pieces on the floor and have him lower up and down from a short kneel position- buttocks touching heels, and back up to a tall kneel position. This activity is great for thigh strengthening, too. Please keep in mind, there is a small population of children that, due to either Orthopedic or Neurologic conditions, can only sustain a “W” position and have great difficulty achieving alternative positions. If your child falls into one of these categories, please discuss with your Pediatrician and clinical support team prior to attempting alternative positions. Remember, your child wants to “W” sit, but it’s your job to discourage him and encourage a new position as much as possible. Good luck! Amanda Math MPT, received her Masters Degree in Physical Therapy from Rutgers/UMDNJ in 2001. She is the principal Physical Therapist at Jumping Jax. Amanda has extensive experience working with children of all ages. She has been evaluating and treating infants, toddlers and children with a wide variety of developmental, neurological, musculoskeletal, and congenital impairments. She incorporates her passion for physical therapy with her love of athletics and has completed extensive course work. Amanda has presented multiple workshops for parents, Special Education Preschools and Elementary Schools throughout her career on a variety of developmental, neurological and musculoskeletal topics. Our children are bombarded on a daily basis with sensory information. When they walk out the door in the morning to go to school, to a class, to the park, or to the store, they must take in information from the five senses. They hear fire engines go by, cars honking, or people talking. They smell pleasant and not so pleasant odors. They see cars and buses whizzing past them. They feel the sun or the rain on their skin and carefully maneuver around objects and people on the street. They taste different foods and textures during snack or meal time. Once exposed to all these stimuli, a child must work to make sense of what he is being exposed to and put it all together in order to, for example: walk down the street, stop at the corner, wait for the light to change, and then cross the street when appropriate. For some children, the sensory information they take in somehow gets jumbled and they cannot make sense of what they are being exposed to. Given that sensory traffic jam, for that child, the car honking is too loud (they cover their ears), the cars whizzing by make them dizzy, the tag on their clothing feels painful against their skin, the yogurt for breakfast feels slimy in their mouth, the food truck on the corner smells awful, and the sun is just way too bright. Most kids can handle all this sensory input without even thinking about it, but some children become so focused on how these sensations feel that it can interfere with simple everyday tasks. Transitions can be difficult as these children become panicked by not knowing what to expect next (will it be pleasurable or painful?). 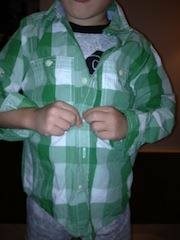 As parents, it is essential to be detectives and pick up on cues as to why your child is having a hard time transitioning or why he is having a meltdown when you ask him to get dressed. What seems to be the trigger? Perhaps your little one is not having a tantrum just because he is being “difficult” but rather, he may not be able to use the right language or actions to express these overwhelmed sensory feelings. It is amazing to see how children progress from being completely dependent to self-sufficient little people. Becoming independent in self-care is a very important occupation of a child. Oftentimes I see parents and caregivers rushing to put on their little one’s shoes and socks, putting on their jackets, washing their hands for them, and feeding them lunch quickly. In the rush to get to camp, school, a class, an appointment or a play date, it is easy to just do all self-care tasks for our children. Developmentally our children show signs of independence at a young age. By the time your child is about 6-9 months (sitting upright independently); they are beginning to finger feed and can hold a bottle with two hands. You begin to see them try to assist when you are getting them dressed by extending their arm or leg while putting on their clothing. By the time your little one is 15-18 months, he is beginning to attempt to feed himself using a spoon or a fork (lots of spillage is expected) and beginning to remove socks and shoes. By the time your child is 24 months, he is beginning to do more things independently. He can unbutton large buttons, begin to put on shoes and socks with assistance, undress with assistance (pull down pants, remove arms from the shirt sleeve), and is more precise with the use of utensils. He is beginning to understand how to rub his hands together to wash his hands, how to hold the toothbrush to assist with brushing his teeth, can assist with washing himself in the bathtub with a sponge, and is learning to put his dirty clothes in the laundry hamper. He will need a lot of reminders as to the order of things, but most children yearn to demonstrate a new-found sense of independence. By the time your child is three, he should be an active participant in all self-care tasks, not just a passive observer. It is important to encourage your child to feel a sense of accomplishment with these everyday responsibilities. It is the beginning of his understanding of a routine, that there is sequence and order to tasks, and that it is essential to master these lifelong skills. 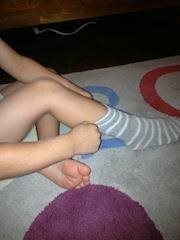 Encourage your child to use both hands to assist with tasks like putting on socks and shoes and buttoning. Use your hands over his hands to show him how to use them in a coordinated manner. Perhaps you do one sock and he does or attempts to do the other one with the ultimate goal for him to eventually do this all by himself. A good way to encourage this independence is through the use of a sticker chart. Reward him with a sticker every time he tries or completes a task independently. As your child gets older, pick one or two tasks that you really want him to work on such as getting dressed or eating lunch all by himself and focus on the mastery of these skills before moving on to another one. Remember that you are building the foundation for a confident, responsible, and independent child. Karinna Dancourt MS OTR/L received her Masters Degree in Occupational Therapy from Tufts University in Boston, Ma in 2001. She is the principal Occupational Therapist at Jumping Jax located in Manhattan on the UWS. Karinna has worked in a variety of settings including hospital based, school-based and Sensory Integration clinics performing evaluations, direct treatments, consultations, and school observations. She has extensive training in Sensory Integration, Handwriting Without Tears/handwriting interventions, and neurodevelopment treatment for children ages 3-18 years old. Karinna is bilingual in Spanish and English and is a proud mother of a four and one year old. As an occupational therapist I often get phone calls from parents asking about their child who is struggling with handwriting. Most of the time, it is the preschool teacher who first calls attention to the child’s fine motor skills. This is logical as preschool is the time children begin to use a pencil to form shapes and write letters. My advice is always to find a way to work fine motor activities into everyday life. This task may seem daunting, so let me explain to you how easy it can be. I have an almost 4 year old son, Max, who has been unknowingly working on these “fine motor skills” since he was a baby. In order to be able to hold a pencil or a crayon and move it to form shapes and letters, a child has to have good strength- not just in his hands but throughout his arms and into his shoulders. 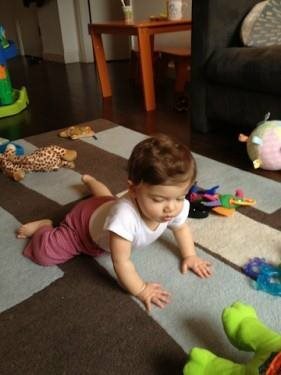 From infancy, you can help your child develop this strength through simple tummy time activities. Once a baby begins to place his hands flat on the floor and push his chest off the ground, he starts to put weight through his hands. This, in turn, helps to build the arches in his hands- something that is crucial later on in life when he begins to use a pencil for writing tasks. As your baby grows and begins to crawl, he further strengthens his hands by placing even more weight through them. Your child’s hands need to explore different textures, shapes, and sizes. Offer opportunities for your little one to play with toys such as foam blocks, textured balls, and foamy soap in the tub, and to use his hands to explore different textures such as shaving cream and sand. Allow your child to get messy with his food during mealtime and to use play dough. Of course, you want to make sure these last two activities are kept separate, as we don’t want our little ones eating play dough! 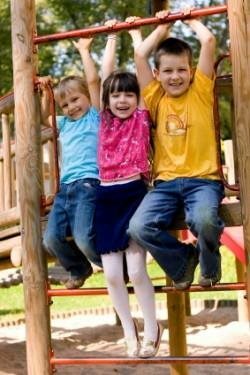 On the playground, encourage your child to hang on monkey bars or climb on the jungle gym. Offer opportunities for your child to perform activities on a vertical surface. 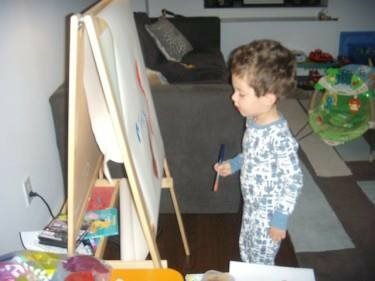 For example, have your child paint or draw on an easel or blackboard. I often recommend that parents tear out pages from coloring books, tape them to the wall, and invite their child to color the pages standing or sitting in front of them. You can even get a little crazy and paint an entire wall or a portion of a wall with chalkboard paint (my husband still can’t believe I did this one night) and give your child free reign to create whatever he wants. Working on a vertical surface develops and fosters upper body strength and endurance while placing the wrist in an optimal position for fine motor work. As your child learns to hold a crayon, you can offer different types of crayons, such as triangle shaped or chunky crayons. As your child gets a little older, give him small pieces of crayons to hold (In total disclosure here- Max hates it when I break his crayons in half!). When your child colors with these crayon pieces, he is forced to use the smaller muscles of the hand rather than the whole hand to hold and manipulate the crayon. Bathtime is a great opportunity to “work on” fine motor skills. I often give Max the chance to squirt water out of a water bottle, make shapes on the bathtub wall using shaving cream, and then “erase” his designs by squirting water out of little animal squirt toys. Another great activity is to give your child a thick washcloth and have him ring water out of it. My most important piece of advice is to encourage your child to have fun exploring and using his hands. Your little one will never even realize that Mommy’s master plan all along was to force him to use every tiny muscle in his hand in order to develop and strengthen fine motor skills.